People affected by dementia are often concerned about whether the condition can be passed along in families. Here we discuss the role of heredity in Alzheimer’s disease and other forms of dementia. Dementia is the term used to describe the symptoms of a large group of illnesses which cause a progressive decline in a person’s functioning. It is a broad term to describe a loss of memory, intellect, rationality, social skills and what would be considered normal emotional reactions. Alzheimer’s disease is the most common form of dementia, accounting for 50% to 70% of all cases of dementia. It occurs relatively frequently in older people, regardless of family history. For females aged 65 to 69 years dementia affects 1 person in 80 compared to 1 person in 60 for males. For both males and females aged 85 and over the rate is approximately 1 person in 4. The genetic material that we each inherit from our parents is packaged into structures called chromosomes. We have 22 pairs of chromosomes plus two X chromosomes (women) or an X and Y chromosome (men). Each chromosome contains thousands of genes like beads on a thread. Genes contain information - they are the blueprints for making a person. Each gene has the instructions for making one tiny aspect of a person. They are the basic units of heredity that allow specific characteristics (e.g. hair colour, height, the tendency to develop diabetes in late life) to be passed from one generation to the next. A mutation is a change in a gene. Some mutations are beneficial but many are potentially harmful. With regard to diseases, some genes are causative e.g. if a person inherits a gene for a certain form of muscular dystrophy, they will certainly develop that illness in life. Other genes are so called risk factor genes - they may not irrevocably lead to a person developing a certain illness such as diabetes, high blood pressure or Alzheimer’s disease but some genes can make this more or less likely. Having a close relative with the Alzheimer’s disease is not evidence of a genetic link. People who are influenced by risk factor genes are only at a slightly increased risk in developing the disease than the average population. The most important gene discovered to date is the Apolipoprotein E gene, which is found in chromosome 19. This gene occurs in three forms in humans: types 2, 3 and 4. Every person in the world carries two Apolipoprotein genes: they can be the same type (2,2; 3,3 or 4,4), or a mixture of two types (2,3; 2,4; 3,4). What has been found is that people with at least one type 4 and especially those with two, such as 4,4, are at an increased risk of developing Alzheimer’s disease earlier in life than those with the other types of Apolipoprotein E. Nevertheless half of the people aged 85 who have 2 copies of apolipoprotein E 4 do not have symptoms of Alzheimer’s disease at that age. People with type 2, especially 2,2, appear to be protected against developing Alzheimer’s disease, until much later in life. Researchers do not understand why this is so, and there is much research underway to find out why. The type of Apolipoprotein does not mean definitely that Alzheimer’s disease will or will not occur. Indeed it is known that some people can reach 90 with type 4 and not develop dementia, whereas others with type 2 can develop dementia much earlier in life. What this means is that the type of Apolipoprotein a person has, is not enough on its own to cause Alzheimer’s disease. One rare form of Alzheimer’s disease is passed from generation to generation. This is called Familial Alzheimer’s disease (FAD). If a parent has a mutated gene that causes FAD, each child has a 50% chance of inheriting it. The presence of the gene means that the person will eventually develop Alzheimer’s disease, usually in their 40s or 50s. This form of Alzheimer’s disease affects an extremely small number of people – probably no more than 100 at any given time among the whole population of Australia. Three genes have been identified which, if mutated in certain ways, will cause FAD. These are called presenilin 1 (chromosome 14), presenilin 2 (chromosome 1) and the amyloid precursor protein gene (APP) on chromosome 21. Genetic testing can identify specific changes in a person’s genes. This test can tell if a person has FAD and if a child has inherited the changed gene from a parent and will develop the disease in the future. It cannot determine when the symptoms will begin. It is essential to ensure that suspected cases in the family have, or have had, Alzheimer’s disease and not some other form of dementia. This can only be done through a medical examination, or a careful analysis of past medical records if the person is no longer alive. The decision to undergo testing for FAD is very complex and the advantages and disadvantages must be carefully considered. The test does not produce a relative risk of acquiring the dementia, but is a definitive prediction of whether a person will get a profound and progressive illness in one’s middle years. The test can only be completed with the informed consent of the person being tested. No one should ever be pressured to have such a test. Knowing that you are carrying the gene may help some people plan for the future. It enables them to consider future lifestyle choices and to let their wishes be known to someone they trust. However, given that no cure is available an individual has to consider whether they want to know that they will develop dementia at some time in the future. To help people consider these issues specialised genetic counselling is essential. The doctor can provide details of this service. In the future, when preventive treatments for Alzheimer’s disease become available, there may be increased reasons to seek testing. Some other rare forms of dementia can also be inherited. These include Huntington’s disease and some forms of Fronto Temporal Lobar Degeneration, where behaviour changes before any change in memory. All these inherited conditions are very uncommon in the general population. If you are concerned about the risk of inheriting Alzheimer’s disease, Dementia Australia provides professional staff for counselling and support. 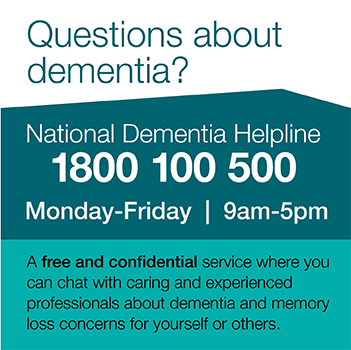 Ring the National Dementia Helpline on 1800 100 500 to arrange an appointment with a counsellor. This service is confidential and sensitive.